Madhya Pradesh's Distribution Franchisee bidding at last saw a progress in bidding phase with last 3-4 revisions and deferment. 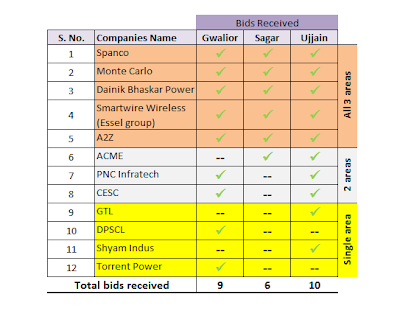 The bidding was closed on 16th February 2012 and total saw 12 companies. The final winners are likely to be announced by 27th or end of Feb.
Ujjain received most number of bids (10), followed by Gwalior (9), and last Sagar (6). See our earlier blog "Ujjain DF Webinar: Rs. 70 cr. Capex, given AT&C loss reduction trajectory and Rs. 3.5 Levelised Input price can bring 8.79% Equity IRR"
Amongst those cos. bidded in 1-2 areas, ACME is one distinct group that bidded in Sagar. None of the established players running 'full privatisation' model at Delhi, Mumbai and Orissa participated. This include Tata Power (including NDPL), Reliance and Noida Power (NPCL). There seems to be interesting lobby to support full privatisation over Distribution Franchisee. Amongst existing Distribution Franchisee operators at Nagpur, Aurangabad, Bhiwandi, Agra, Kanpur, Jalgaon, only SPANCO opted to bid in all 3 areas. GTL and Torrent Power played low by bidding in only one area. SPANCO seems to be really supporting DF model growth with hope to innovate a rural dominated, low volume Sagar DF model. Sagar area, based upon its low capex requirements and low volume seems to be good entry strategy for new players and hence most new players to DF have opted to bid for it, hoping to get first entry. 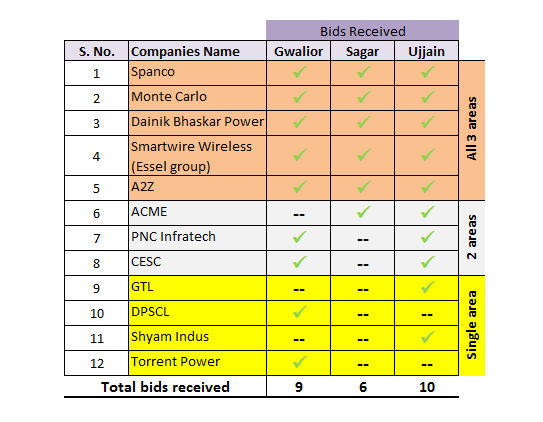 6 companies out of 12 - Monte Carlo, PNC Infratech, DPSCL, Essel group (SmartWire Wireless), Shyam Indus and ACME are new names and first time bidding for DF. Out of these, PNC Infratech, DPSCL, Essel and ACME seems to be late entrant, as they didn't participated in any previous pre-bid meetings. The competition seems like good and there is good interest in final bid turnouts for the three areas. At pManifold we continue looking forward to support strengthening of the DF model in India. We will soon be coming with a very detailed Distribution Franchisee Market Research report and will cover more detailed operational and financial DF know hows.